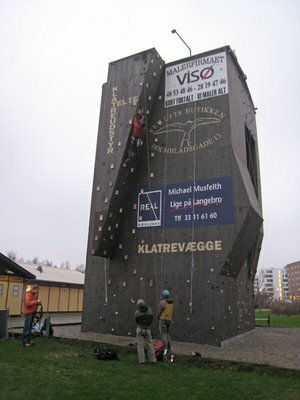 The ice climbing season is quickly approaching and luckily we have an outdoor climbing wall 300 meters from my home which has given us permission to use the wall for drytooling :-) We have thus fitted the wall with wooden holds, rather than traditional plastic climbing holds, which gives great grip for ice tools. This weekend was my first go on the wall this season and it was great fun. 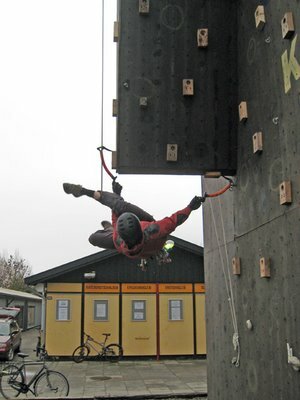 I went there with a couple of friends including Kristoffer Szilas which is among the best mixed climbers in Denmark. It was in particular fun watching him negotiate an overhang by a figure 4 followed by a figure 9 - see the video below! The climbing tower on Artillerivej 71. 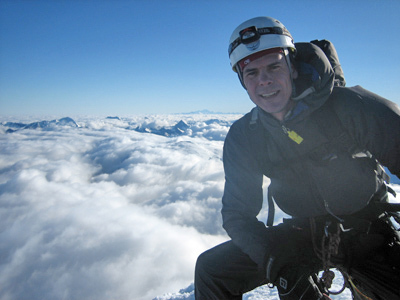 Note the light colored wood holds for drytooling on the left. Kristoffer Szilas doing a figure 4 to negotiate the overhang. Kristoffer Szilas climbing the wall. That looks super cool! Not much of anything like that being built where I live... we have to make do with Schmoolz indoor dry tools.